Intel i7 8750H – The power to move you? It’s been a while now since we sat down and took a good look at any of the mobile processor releases. It’s a market segment that has been crawling along slowly in recent years with minor incremental upgrades and having checked out the last couple of mobile flagship chips, it was obvious that with each generation we were seeing those refinements focused more on improved power handling rather than trying to extract every drop of performance. Admittedly in the shape of last years 7700HQ they perhaps got closer to the equivalent desktop model than any generation previously managed to achieve in previous years. Whilst welcome, this was really more a symptom of stagnating desktop speeds, rather than any miraculous explosion in mobile power. Whilst the chip itself was a great performer, the fact that it got there by eaking a few percent generation, upon generation… well, by the time we got there, it was all ultimately a little underwhelming. But now, thanks to AMD’s continued push in the current desktop CPU war, we’ve seen Coffee Lake emerge from the blue camp and now we’re going to get hands-on with the mobile equivalent. 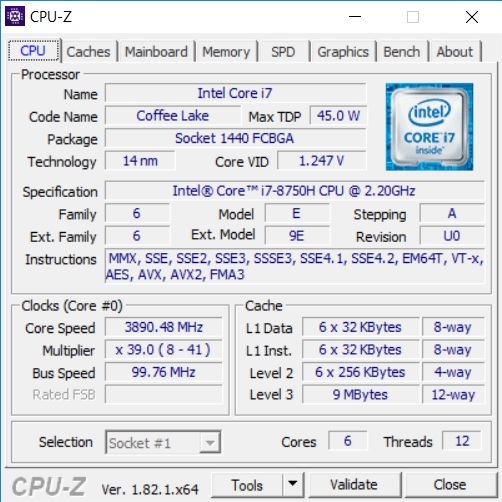 The i7 8750H we have here today is a 6 core with hyperthreading, running with a base clock of 2.20GHz and a max single core turbo frequency of 4.10GHz and leads the way when it comes to mobile i7’s. 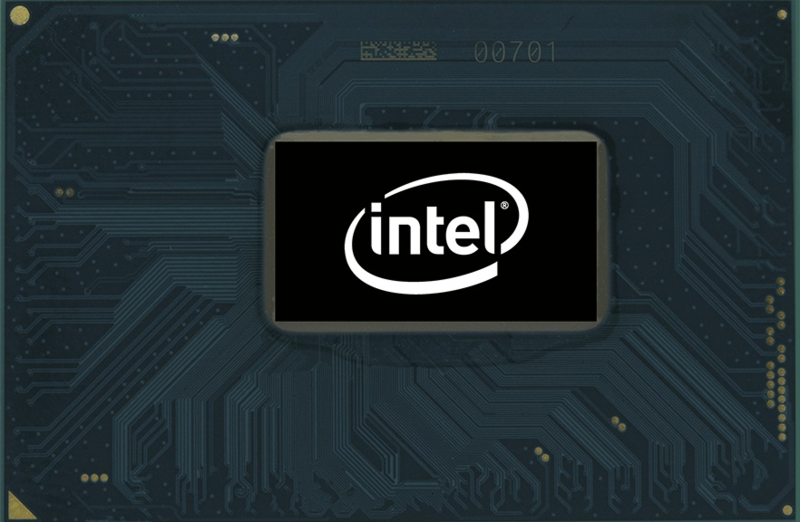 Just as a side note before we kick this off, there is another chip above this, in the form of the i9 8950HK which is also 6 cores + hyperthreading but with another 500MHz on the clock. I mention this as Apple has just announced it’s going into the flagship Macbook later in the year, we do have them due to land with us in PC laptops as well in a month or two, so I will be benchmarking that when it arrives with us too. Already in the very first screenshot above, we’ve inadvertently tipped a nod to what’s going to be the crux of this write-up. The clock speeds are somewhat wide-ranging, to say the least. On paper, there is almost 2GHz worth of clock between the base and turbo clocks. Keeping in mind that it’s single core turbo only up to the 4.1GHz and suddenly you find yourself asking about what the rest of the cores will be doing at that point. Quickly throwing CPUid on and running it returns us a result of 3890GHz, which if it had been all cores would have been rather impressive for a mobile chip. In this instance, however, I wasn’t doing anything other than sitting on the desktop when this snapshot was taken. The score you see is the highest core score and it’s hyper-thread was showing as matching it. The rest of the cores, however, well, they were largely unused and sat around the baseline 2.0GHz – 2.6GHz level. What we really want to know of course is what sort of average speed we can expect from all the cores being kicked up to 100% load. Any longer term followers of these pieces will already be well aware that my preference for testing involves doing an all core overclock or in more basic terms, I tend to favour locking all the cores to the single core max turbo speed. Yes, it’s an overclock, but it’s one that the chips are kind of rated to. Admittedly, it’s not rated to quite the level we’re working at here, but hey… that’s why we favour some chunky aftermarket cooling in those systems to make everything alright. Except, when dealing with laptops we can’t go strapping a large chunk of copper to it, in fact, a lot of the tweaks we would wish to make on a desktop system, simply don’t exist in laptop land. Often with laptops, it’s a case of a unit either working out of the box or with a few basic tweaks or otherwise due to drivers or hardware choices it’ll never really be suitable for the sort of real-time processing required for working with audio. I grabbed a copy of AIDA64 and gave it a quick run, at least enough to force the CPU to load up all the cores and simulate a heavy workload and how those cores would respond to such a load. What we see here is all the cores being pushed, with the highest speed core running about 3000MHz in the screenshot. Monitoring it in real-time it was bouncing around 3000 – 3200MHz range. Similarly, at the lower end, we see a core sat around 2600MHz and this would bounce up to around 2800MHz at times. So, where’s our 4.1GHz turbo? Well, that single core turbo only really achieves such lofty heights if the rest of the cores are sat around doing nothing. In the interest of load balancing and heat management should more than a couple of cores need to be turbo’d then all of them will shift to a safer average. You see on desktops with chips that have a range of a 3.8Ghz to 4.3Ghz sitting mostly around the 4GHz level and is why I tend to notch them all up to 4.3GHz in that sort of situation. It ensures no sudden ramping up and down and ensures we get some nice stable but optimized performance out of a setup without taking any major risks. With these laptops, we don’t get those sort of options, nor I suspect would heat permit us to be quite so aggressive with the settings. Whilst the headline here of 6 cores is fairly unprecedented within a consumer level laptop, and certainly, on a fairly mainstream chipset, it’s a little bit smoke and mirrors with how it’s presented if you don’t fully understand how the turbo presents itself. The potential issues it presents to us are in the form of the ASIO buffer. 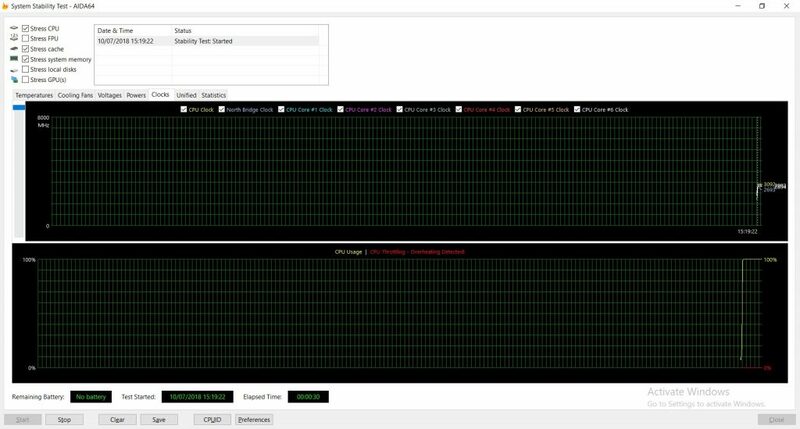 With whole channels being assigned to each given thread, we ideally want the performance level across all cores to be as equal as possible. For audio systems the overall performance can often be limited by how powerful the weakest core is, this is something we need to keep in mind heading into this results roundup. With the DAWBench DSP test, we’re using the SGA1566 variant running under Reaper for this generation of testing and we see the 8750H performing around the level of an entry-level desktop i5 chip. In comparison to previous generations, this isn’t overly surprising as historically the mobile i7 CPU of any given generation tends to sit around the level of the leading i5 desktop solution in the performance stakes. Running the DAWBench Vi test we see similar results here too, with the chip coming in just behind the i5 8400 once again. It’s a reasonable showing and in reality, we’re probably looking at maybe a 25% gain over the last generation flagship mobile chip. Given that we’ve seen 3 or 4 generations now where 10% gains year on year has been the standard then normally we’d be pretty happy about seeing a jump of 25% coming out of single refresh and indeed it’s certainly a far better value option than the model it replaced. However, we saw a jump of 40% on the desktop last year and frankly all we’re doing here is shoehorning in another couple of cores, rather than bringing in a whole new platform. It looks like they’ve played it cautiously by not pushing the chip too much and the temperatures do seem a little on the safe side even under stress testing. To be fair to them, this is pretty much what the average user wants from a laptop chip, giving us quick bursts to deal with any sudden intensive activity, but otherwise, aggressive power-saving to ensure a long battery life when on the move. Which of course, is pretty much the opposite of what most of us power users want, as we tend to be looking for a high-performance desktop replacement solution. It’s clear there is a bit of headroom here which will no doubt be leveraged over the next couple of range refreshes, it’s just a little bit frustrating that we can’t extract a bit more of it right now ourselves. With all that said I suspect that after seeing the CPU war kick expectations up a notch as it did last year, that I may have headed into this with slightly higher expectations than normal this time around. Overall, the final result here is a solid release with above average generational gains that I’m sure will be more than appreciated by anyone who is in the market for a new model this year.